A MFS match at Rookery Waters in Pidley that is turning into an annual event. This is the second year we have descended on the little village of Pidley. A quick breakfast in the pub and the short drive to the fishery. Rookery Waters is going through an expansion with a new lake being dug and a tackle shop being built on-site. Access to Magpie lake has been improved with a road available to drop off your gear. Orderly queue and hands in to the plastic bag with the milk carton tops for our pegs... Peg 23 came out for me... the same peg that I had drawn the previous year. Funny enough, Ricky also drew the same peg as he fished last year. Mark drew his favourite area with Peg number 8. After enjoying great days tuition with Bob Nudd and Andy May I fancied another day with an Angling star. Andy Kinder started to offer tuition days and having met Andy on a number of matches with the Match Fishing Scene lads I decided a day with him would be a good day out! 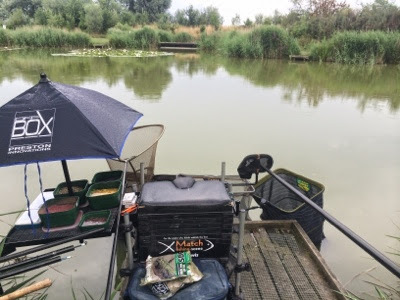 So a quick call to Andy and we organised a session at Roy Marlow's Glebe fishery in Leicester.